This League began in 1897 and, apart from the years spanning the two World Wars, it has been competed for continuously up to the present day. The winning team each season is presented with the magnificent Challenge Cup and second-placed team is awarded the equally impressive Shield. Although the League began in 1897, the first identifiable winner was The ALTHORP Arms in 1899 and the first recognizable runner-up was Lord Cavendish in 1898. Both of these pubs have long -since disappeared. The names on the Cup and the Shield provide a mini record of Northampton pubs and it is interesting to note that of the 52 different trophy winners [1st and 2nd] up to 1970 only six pubs are open for business today. The fortunes of the league have fluctuated over the years. During the Thirties Forties and Fifties up to thirty teams took part. This has slumped to only nine teams in the mid seventies. Since then there has been a slow build-up to the present day when fourteen or fifteen teams are involved. Up until 1999 each team fielded eleven players. Since then 9-a-side games have been played. It is encouraging to note that an increasing number of women players have participated in recent years. 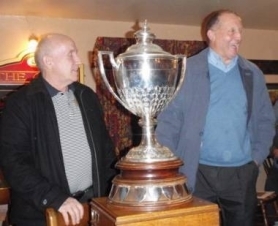 One of the highlights of the year is the Ray Knight Cup, named after a previous long-serving secretary of the League. This began in the year 2000. On one evening at the end of January players from all teams gather at one venue to take part in a pairs Round Robin. Each pair plays seven games. Wins [and if necessary holes differences] are totted up to decide the winner. This is a special social occasion, thoroughly enjoyed by all. The League usually runs from September to April. In 1982 it was decided to run another League to occupy the summer months. This is a Pairs League, each team consisting of three pairs. In the past, this has enabled the entry of some teams which can raise six players rather than the nine needed for the Winter League including, at times teams from villages from the broad area surrounding Northampton.